The Packers did not have any players selected for the 2014 Pro Bowl on Friday, as the complete roster of players was announced by the league. RB Eddie Lacy was named a first alternate. Entering Sunday’s regular-season finale at Chicago, Lacy has 263 carries for 1,112 rushing yards and 10 TDs, all franchise rookie records. 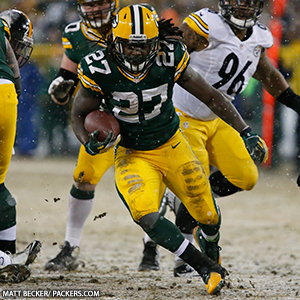 Lacy’s yardage total ranks seventh in the league and his rushing TD total is tied for third. Seven other Packers players were also named alternates. They are FB John Kuhn, QB Aaron Rodgers, G Josh Sitton, LB Clay Matthews, WR Jordy Nelson, and CBs Sam Shields and Tramon Williams.